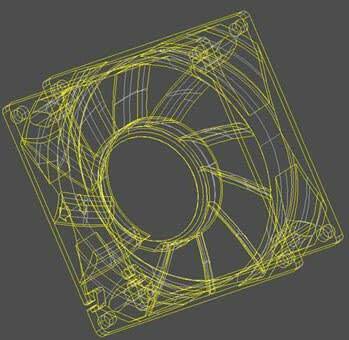 Fan reliability can be evaluated in several ways. 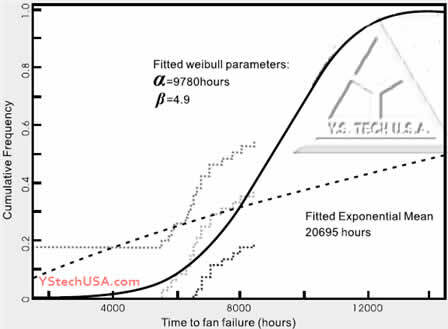 The data for a life test can be plotted as a cumulative distribution that shows the total fraction of fans failing up to any operating time. Fig. lisa sample of cumulative distribution,which was stopped at 8,400 hours after l8outof 48 fans had failed. Some vendors provide life expectancy data to customers based on the exponential assumption. However, life test data does not support the use of the exponential distribution. Nevertheless the past experimentation fitting has shown that the Weibull distribution provides a good fit to real fan life data. After we have verified the correlation between L,, and MTTF, we also need to know how long should a sample size be tested to determine with 90% confidence level that L,. greater than or equal to expectancy value at a test temperature without failure (x=O) Here we introduce the Poisson Distribution to estimate. Normally on the condition of 90% confidence level and 0 failure then Br;c = 2.303. Then we introduce Takes Martin Marietta Model to estimate Life at different environment stress. Where MTTF is an expectancy value.